Description: The Woven Cross Bracelet has elements similar to those of the Celtic Cross. The loops on each side of the woven design represent the arms of a cross. There are crisscrossed areas above and below the arms. This Celtic bracelet is easy to make, and is a suitable Micro-Macrame project for beginners. 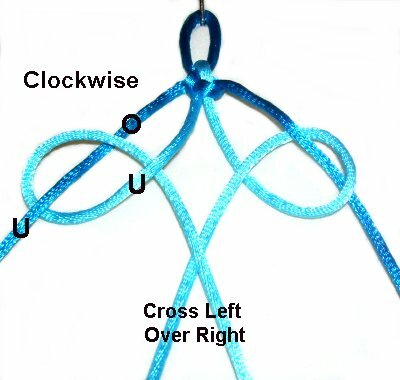 You can also use this design to make a necklace or a belt. The clasp is a simple loop - button closure, which can be changed if you prefer something else. 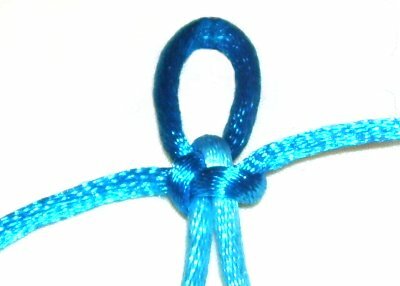 Satin cord was used in the example shown. Paracord is another great option. 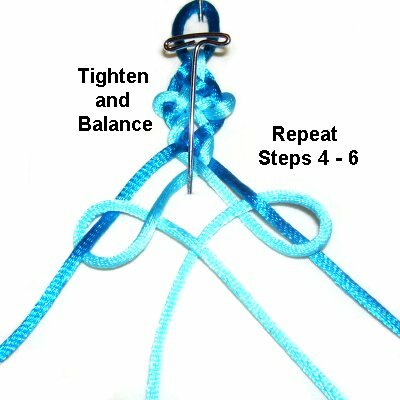 I found this design on the Fusion Knots website. Click on the image or lin to visit the site. 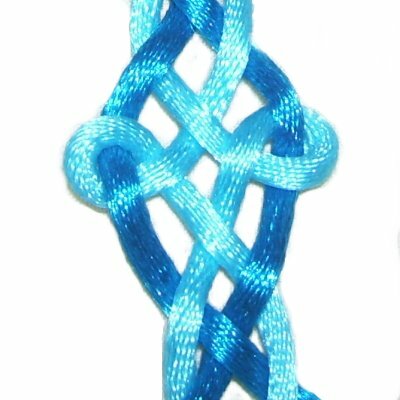 Go to the video gallery and you will find the tutorial for this knot (Woven Celtic Cross). Step 1: For bracelets up to 7 inches, cut 1 cord of each color, 60 inches long. Larger sizes require more material. Prepare the cords by applying glue to the tips. 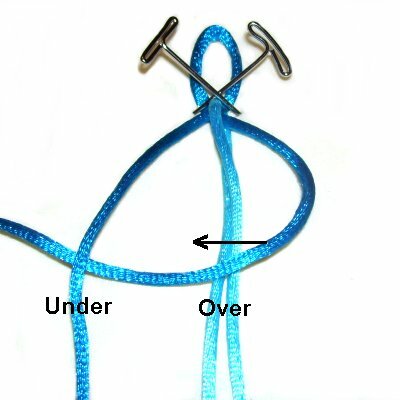 For Satin and Paracord, you should heat the tips to prevent unraveling, before adding the glue. In the images, cord A is dark blue, and cord B is turquoise. 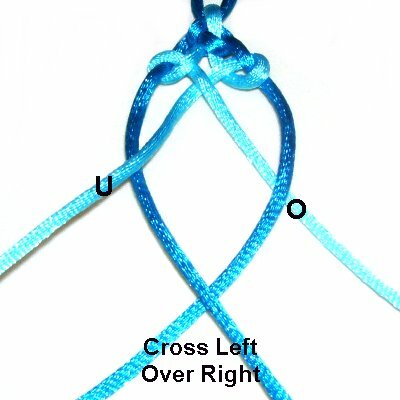 Step 2: The four images below show you how to make the loop at one end of the Woven Cross Bracelet. At the other end, a button is attached. right over left. 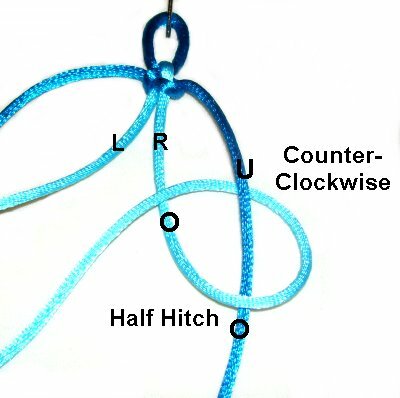 Pass cord B through the loop over - under. over the front of the crossed area. << Move the right half of cord A to the left, over cord B. Pass it under the left half of cord A. Step 3: Adjust the size of the loop so the button fits through it, and then tighten the Half Knot firmly. Step 4: Rotate the right half of cord B counter-clockwise, passing over - under cord A (on the right). As you pull it left, the end should pass over to make the crossing point of the loop. Step 5: Rotate the left half of cord B clockwise, passing under - over cord A (on the left). As you pull the end right, it should pass under to make the crossing point of the loop. 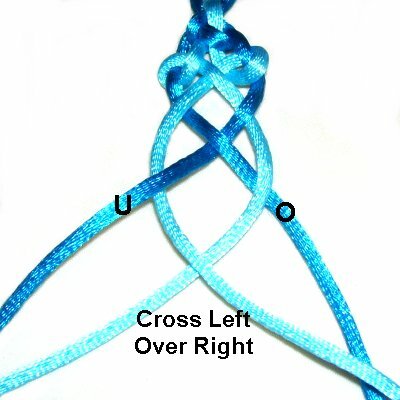 Step 6: Tighten both knots, and cross the left half of cord B over the right half. 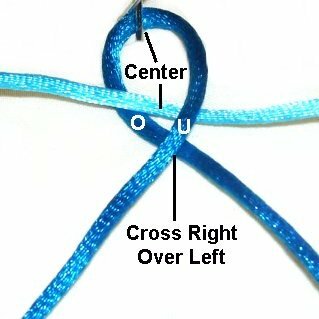 Important: When describing the crossing of cords for the Woven Cross Bracelet, the ends are described where they are currently resting (right or left). << On the right, move the end of cord A over cord B. On the left, move it under cord B. Cross the ends left over right. Tighten and balance the first design, so it resembles the image at the top of the page. Step 7: Repeat steps 4 - 6 several times, until the Woven Cross Bracelet is the size you want. 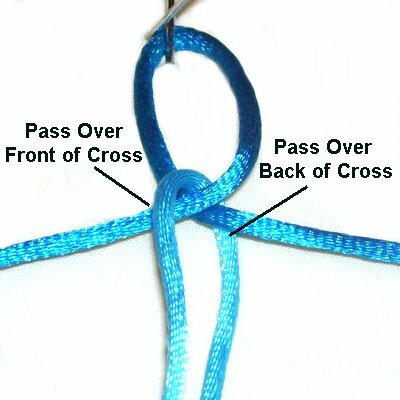 Step 8: Before you complete the clasp, you should tie a Square Knot to secure the last cross design. The best place is after step 6. Use the ends of cord A as the working cords and cord B as the fillers. Apply glue to the fillers before tightening the Square knot (so it's on the inside of the SK). 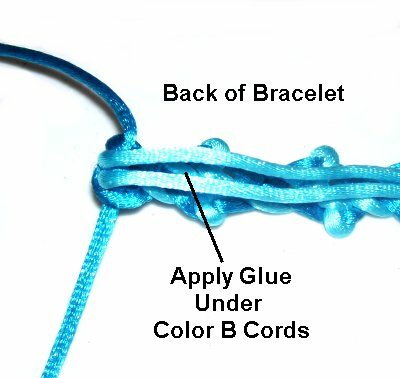 Fold the ends of cord B to the back of the Woven Cross Bracelet. Apply glue under them and use a clip to hold them against the back of the the last cross design. 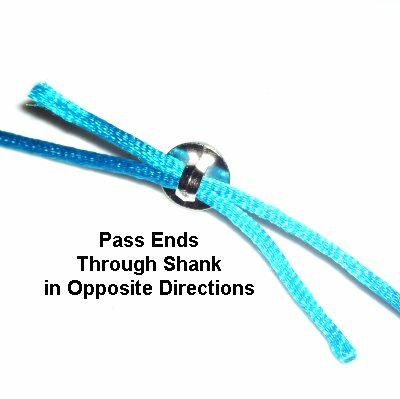 Pass the ends of cord A through the shank of the button, in opposite directions. 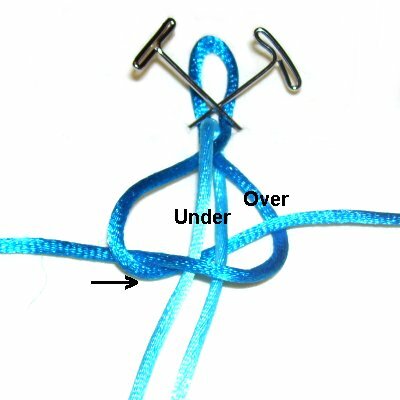 Tie a tight Overhand knot to secure the button, once it's positioned where you want it. Apply glue to the shank during tightening. When it's dry, cut off the extra material. Have any comments about the Woven Cross Bracelet? Contact Me.